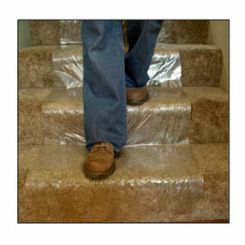 Carpet Film for stairs is an extremely popular surface protection option for homeowners looking to keep their stairs clean during remodel and paint work. Easy to apply and rated for 35 days, carpet film makes cleaning up after a project quick and easy. Specially designed for stairs in mind, stair carpet film is regular wound making it easier to apply to the vertical surface on stairs. Whereas standard adhesive surface protection films are reverse wound, regular wound stair carpet film is designed with stairs in mind. Regular wound film allows the user to quickly push the film down the vertical stair treads, ensuring better adhesion to the backs of stairs. Carpet film for stairs in available in 32″ x 200′ lengths, covering up to 533 sqft of carpeted stairs. Carpet Film is 3.0 mils thick, which offers more protection than discount 2.0 mil films do. Each roll is $63.00. This entry was posted in Dust Control, Surface Protection, Uncategorized and tagged carpet film, carpet film for stairs, surface protection by admin. Bookmark the permalink.